Huacachina is a tiny town in southern Peru. It's about an hour's drive from the Pacific coast is a popular tourist destination in the area. There are a decent number of resorts and restaurants that surround the blue-green lagoon. The area is also famous for its impressive sand dunes. Most visitors come to the area for the unique dry desert setting, and the opportunity to sand board or ride in dune buggies. This is a tourist town and it's the economy is entirely dependent on tourism. There are a handful of interesting places to stay in the area including a few hostels that offer interesting activities for good prices. 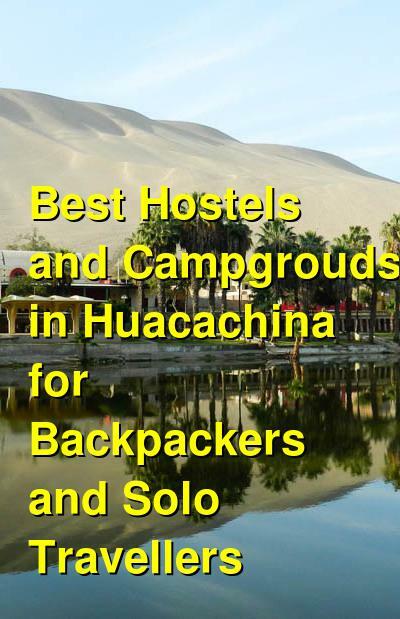 How much do hostels in Huacachina cost? A good hostel for backpackers, solo travellers, couples, and small groups. Banana's Adventure is one of the most popular hostels in Huacachina, Peru. It's a fun place to stay with a lot of activities for guests. There are some great amenities included in the price of your room. If you stay in a private room, one activity a day is also included. Your activity options include a dune buggy tour with sandboarding, a barbecue dinner, or a winery visit. Breakfast is also included in the price of the room. This is a clean and fun place to stay where you can be assured a good night's sleep. 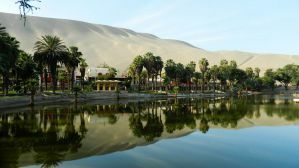 It's a family run facility that is beautifully located overlooking the Huacachina lagoon in Ica-Peru. It has all kinds of amenities and services for guests including a swimming pool, hammocks, and a peaceful setting with natural palm trees. If you want to soak up the outdoors and meet other backpackers and young travelers, then this is the place to stay. The staff here are friendly and helpful. They have over fifteen years of experience and can answer any questions you may have. They can also help you coordinate any activities or tours that you might want to do and can suggest great food and drink options. There are private double rooms and dorms that sleep four or six people available. El Boulevard is another good hostel option in Huacachina. It has a large garden area that connects the different bedrooms and the rooms are each decorated with a nice, modern style. The hostel offers all kinds of activities for guests including sand boarding and dune buggy tours. It's also a lively place to stay where you can spend your evenings at the karaoke bar. Many guests love hanging out in the bar and you're sure to make a few new friends while you're here. The hostel is located on the left bank of the lagoon, before the trading zone. It's located in the "Laguna de Huacachina, in a quiet part on the left side of the lagoon. It's also about five kilometers from the city of Ica, which is easily accessible by car or taxi. This is a smaller place to stay, with only four rooms. The rooms themselves are quite large and comfortable, and each room has its own bathroom with hot water and comfortable bedding. There are double private rooms, a four bed private room, and a ten bed dorm available. Desert Nights Ecocamp is a unique and relaxing place to stay on the quiet side of Huacachina. You can be assured a good night's sleep here and you can enjoy all of the great amenities including the large pool with a great area for sunbathing. There's also a swim up bar and evening barbecues that provide the perfect opportunity to meet other guests. If you're looking for a place to relax and decompress after some hectic days on the road, then this is the place for you. The hostel also has a shared kitchen which guests can use, luggage storage, and wi-fi throughout. There are all kinds of discounts and tour information available. Desert Nights Ecocamp is located right next to the dune buggy entrance to the sand dunes. It offers impressive views of the whole town and is about 200 meters from the main pedestrian boulevard. It's also about ten minutes from Ica city. There are thirteen large tents around the property. Seven of the tents have two double beds and six have one double bed. There's a fan to help keep you cool and cement floors that keep things clean. This is a unique and fun place to stay.